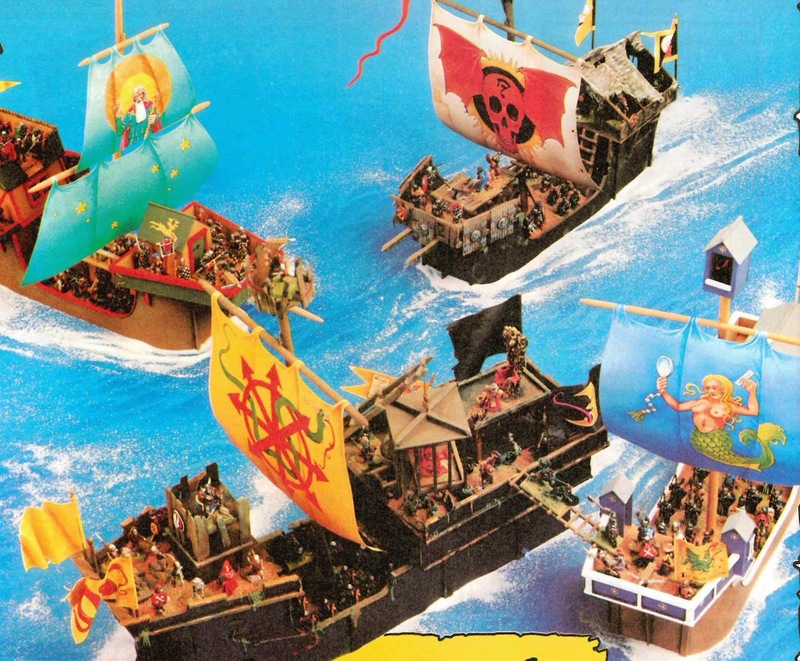 Oldenhammer in Toronto: Naval Combat in Oldhammer: "All the Nice Dwarves Luv a Sailor"
Naval Combat in Oldhammer: "All the Nice Dwarves Luv a Sailor"
Ship to ship combat -- with boarding parties, grapples and rams -- is the one thing missing from old school Warhammer Fantasy Battle. Or so I thought... until yesterday. I was flipping through an old White Dwarf, and stumbled on a short but pithy article by Gary Chalk. Mr. Chalk is best known as an illustrator (creating the iconic drawings for Talisman and Lone Wolf), but he's also a modeler and a game designer extraordinaire. His talents in all these respects are on full display in his article on naval combat. Even the title, "All the Nice Dwarfs Luv a Sailor" is the sort of goofy cultural reference that made vintage Warhammer so much fun. The rules themselves are a miracle of economy. There's little (i.e. no) emphasis on army points, or balanced rules. Instead, there are simple guidelines for bringing the ships together in a great smash and fighting infantry melees on the decks of each ship. It reminds me a little of how the Romans won the First Punic War: fight sea battles like they're actually land battles by rushing on to your opponents ship and throwing some stick around. Naturally, "All the Nice Dwarfs Luv a Sailor" embodies the do-it-yourself ethos of the true hobbyist. 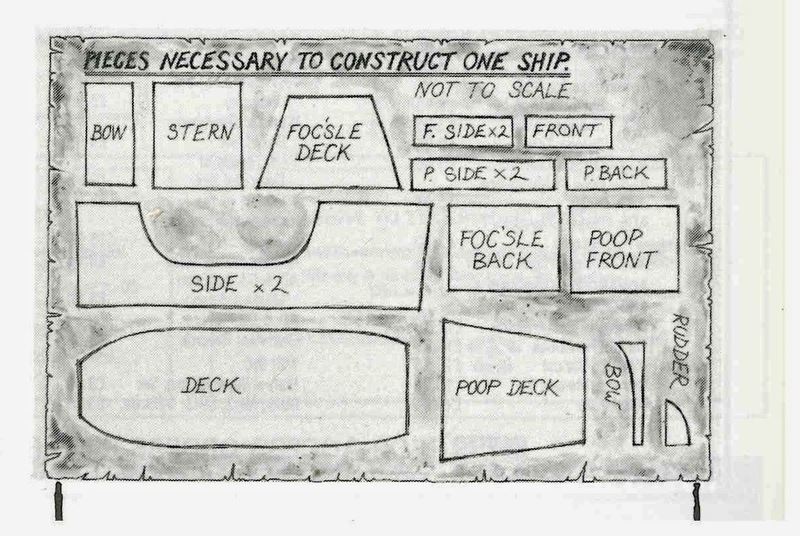 It contains a useful template for constructing your own ships for 28mm miniatures, and tips for including such features as a winch-suspended cage of warriors that is to be swung over an opponent's ship and emptied on to the deck.The whole article is clearly designed to get miniatures on the table in the most chaotic and colourful way possible. 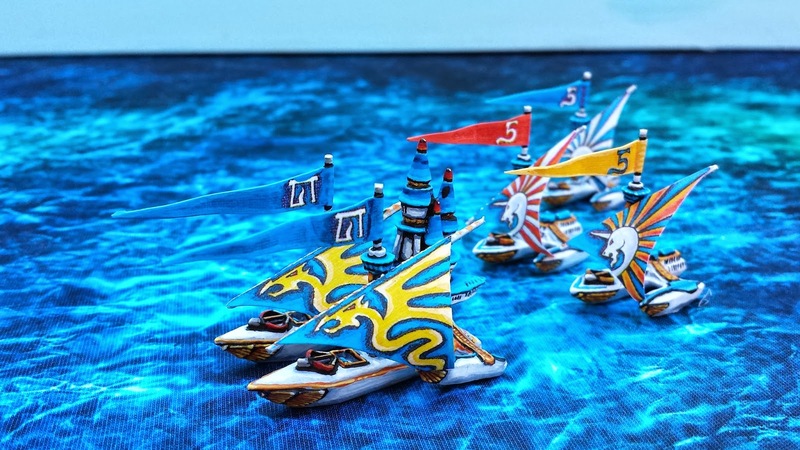 I'm hoping to get a couple of these scratch-built vessels for my own table - I may be ambitious and try to replicate (and scale-up) an elven ship from that great game, Man O'War. I'll keep the blog updated with my progress. As I did a little research on these naval rules, I ran across the interview Gary Chalk did with the BBC journalist Samira Ahmed in 2012. It's clear that Mr. Chalk also pines for the days when Games Workshop emphasized creativity and freedom, rather than a rigid codex of rules: "People used to invent things -- E.g. dwarf hang-gliders and hot air balloons and invent rules to use them in the game. I came up with naval ships -- we called the game 'All the Nice Dwarfs Love a Sailor': -- they were fun add ons." He's not so keen on the current state of the hobby, summing up modern Warhammer in three words, "It's all pain." For those who don't have access to White Dwarf 83, the best scan (much better than my own attempt) is found at the most excellent website of Project Aon, which is dedicated to the Lone Wolf books that Mr. Chalk illustrated. The pdf is here, and "All the Dwarfs Luv" starts at page 104. Let's hope Gary's great article continues to inspire a few more orcish Trafalgars! What excellent timing for you to post this; several of us were chatting about a naval element being added to the Big Game for BOYL15.